Krank is one of the freshest new galleries in Istanbul. Compact in size and sleek in interior design, the gallery has so far offered a tasteful line of exhibitions: Güneş Terkol, Aslı Çavuşoğlu and Camila Rocha all showed their latest works at this small gallery located on Tomtom Kaptan Street. When I visited it this month, Krank reminded me of Galeri NON, which sadly closed its doors in 2015. The two galleries, in artistic taste and spirit, somehow complement each other. "0536 075 56 83" is the title of Krank's new exhibition, and it features some interesting and thought provoking work. Zeren Göktan, in her unsettling photoset, produces a delicate balance between foregrounds and backgrounds. Her characters present themselves to the camera and stand in stark contrast to the mysterious, dark world that surrounds them. In "Backyard 3" from 2016, Göktan photographs a girl sitting on a ladder. Surrounded by cactuses, the girl seems vulnerable and yet eager to explore her surroundings. Another work features towers of plastic chairs. Calm, silent trees are in the background. A child sits on top of the tower of chairs - it is a beautiful and yet disturbing image. "Pursuing the possibility of a new and fictional language in her works, Zeren Göktan evaluates the codes of the society and the culture in which she lives in her artistic practice," Krank's curators explain. "The point of view that she employs in her projects, which have a fictional and sometimes even a spontaneous tone, aims to make visible the conditions in which an individual lives, as well as their problems and sensibilities concerning their era. Göktan's subjects, in terms of the narrative she delves into, and the scene compositions, gestures and mimics, which she attends to in the finest detail, all originate from the meticulous and scrutinizing component of her identity as an artist." Göktan's work brings to mind famous photographs of Alice Liddell taken by Charles Dodgson, more commonly known as Lewis Carroll, author of "Alice's Adventures in Wonderland." Tensions between innocence and a thirst for danger animate Göktan's work. In an essay for the exhibition, London-based curator Fatoş Üstek points to how "while the 'Backyard' (2017) series includes children and the city's relationship with games and playing into its frame, the 'Home' series portrays other living creatures that live in the city together with their living places. Although Göktan's photographs have been planned and composed ahead of time, they emanate a sense of being captured as a snapshot." Indeed, this snapshot quality of Göktan's 'Backyard' lead the viewer into questioning their compositions. Why has she photographed waste in such a persistent manner? What does the strange tension between nature and slum dwellings in her photographs imply? Has it all been planned and carefully drawn out in advance, or is the image a product of random discovery? "The phone number '0 536 075 56 83' that gives the exhibition its name, also appears in one of the photographs in Göktan's Backyard series," Üstek says. "Inspired by this number, in a sound work that they have produced in collaboration, the two artists present the white noise of the city that they have dreamed of." At Krank, visitors can listen to that white noise of the city - a baby cries, someone prepares breakfast and then the city's noises envelope it all. The audio recording reminded me of "Atom Heart Mother," a Pink Floyd album whereon the band captures sounds of mundane English life in experimental music. But "0 536 075 56 83" is conceived in a more playful way. Artists have put the number in different parts of Istanbul to invite people to dial it. Those who call the number can hear the audio recording, Krank curators told me, but when I tried calling, the number was disconnected. Canevi's mixed media installation, "Caffeine Makes For Busy Bees", transforms and repurposes waste. His coffee cups, made with way and concrete, resemble modern cities with their state of constant flux. "The materials used in Irmak Canevi's work are, in his own words, 'as unimportant as the artist,'" the curators explain. "On the other hand, what is important is the process of giving them form. Rendering materials to be ordinary in this way means everything can be used in the artistic practice. From this aspect, in the works of the artist we can read a lyrical praise about the way things come together. How and where one element is combined with another is an act that consolidates the holistic evaluation of this montage." If this results in what Üstek terms "a diorama of a fictitious city," Canevi's "Masters at Work" series further explore links between realities and fictions of the modern metropolis. 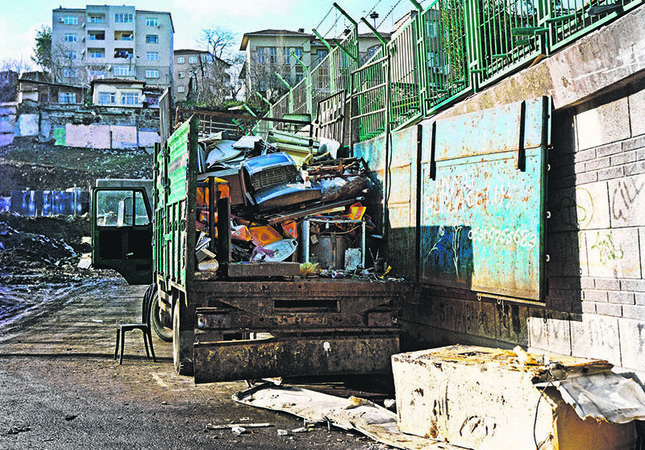 For that work, Canevi has transformed Istanbul streets and arteries important for him into three dimensional works, again using waste as his material. "The city that Canevi composes consists solely of surfaces and forms, and bears no trace of the city's inhabitants," Üstek notes. And it is perhaps this anti-humanist quality that makes "0536 075 56 83" intriguing and worth visiting.